Mealtimes Frustrating at Your Place? Well… All Children have an Appetite for Fun! From the time we are able to understand words we are told not to play with our food. Well mum… sorry! Because that’s exactly how we’re going to break down your child’s resistance to eating! Table manners can come later! Let’s get them eating first. Children learn through play. 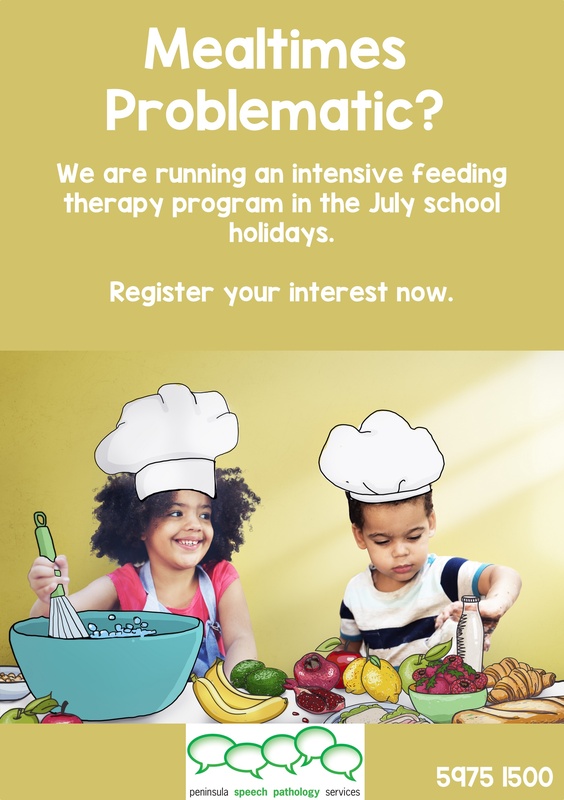 If your child’s thoughts and behaviours towards food have become a little testing then Peninsula Speech Pathology Services July school holiday program may be just what you’re looking for. It’s an intensive 2 weeks of fun and discovery that will reduce or eliminate the barriers some children have to food. While the kids are playing, interacting and having loads of fun, our speech pathology clinicians will be in the background taking care of all the observations and science so we can assess your child’s specific needs. Once we know these, targeted exercises will help them overcome their resistance so they learn to enjoy mealtimes. What a relief that would be! Please call to make your booking. Mealtime sanity is only a phone call away! We are currently running individual and small groups. The next Intensive is planned for January (depending on numbers). Register your interest by ringing 59751500.